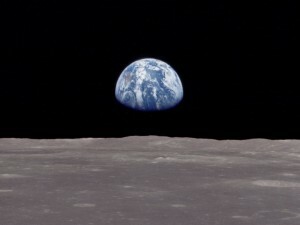 Ecology: Earthrise | Words of Wisdom? Joseph Campbell spent his lifetime studying world religion and mythology. He compared symbols and stories from cultures across time and geography. His insights and articulate expression brought fresh meaning to the biblical stories I was raised on. My childhood in the Christian church was not negative, but in adulthood the mythology was losing its meaning. Bill Moyers’ 1988 PBS series of interviews with Joseph Campbell, “The Power of Myth,” literally changed my life. They instigated several years of personal study on such themes. Campbell pointed to the photo above as the symbol for our time. We can find meaning in any myth if we interpret it symbolically and not literally, but symbols are rooted in their cultures and this one is rooted in ours. The rate of change in communication and transportation that has taken place in my lifetime (let alone in the lifetimes of my seniors) is unparalleled. These advances challenge us to dissolve the artificial boundaries that divide us. Earthrise doesn’t need my menial explanation, because as a true symbol of our time, it speaks to us in a primal way all by itself. We feel it in our guts. If we pause for moment to ponder its full implications, we are moved to tears. “What are you doing Earth, in Heaven? This entry was posted in Ecology and tagged beauty, connection, culture, Earth, moon, myth, stories, symbols. Bookmark the permalink. Lovely post. The awe and wonder of seeing our planet from an entirely different perspective is amazing.